Scientists from the Florida campus of The Scripps Research Institute have identified a single prion protein that causes neuronal death similar to that seen in "mad cow" disease, but is at least 10 times more lethal than larger prion species. This toxic single molecule or "monomer" challenges the prevailing concept that neuronal damage is linked to the toxicity of prion protein aggregates called "oligomers." 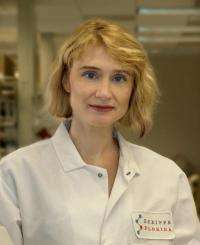 "By identifying a single molecule as the most toxic species of prion proteins, we've opened a new chapter in understanding how prion-induced neurodegeneration occurs," said Scripps Florida Professor Corinne Lasmézas, who led the new study. "We didn't think we would find neuronal death from this toxic monomer so close to what normally happens in the disease state. Now we have a powerful tool to explore the mechanisms of neurodegeneration." In addition to the insights it offers into prion diseases such as "mad cow" and a rare human form Creutzfeldt-Jakob disease, the study opens the possibility that similar neurotoxic proteins might be involved in neurodegenerative disorders such as Alzheimer's and Parkinson diseases. Lasmézas explains that prion diseases are similar to Alzheimer's and other protein misfolding diseases in that they are caused by the toxicity of a misfolded host protein. Recent work, as reported in The New York Times, also found that diseases such as Alzheimer's resemble prion diseases by spreading from cell to cell. The new study adds another twist. "Until now, it was thought that oligomers of proteins are toxic in all these diseases," Lasmézas said. "Since we found for the first time that an abnormally folded monomer is highly toxic, it opens up the possibility that this might be true also for some other protein misfolding diseases as well." The researcher in the photo really should've worn a mask while handling the prions.